We continue to send loads of blankets, winter clothes, and shoes to the hundreds of refugees sleeping rough in Paris. Please email CLARE@CARE4CALAIS.ORG to donate blankets, winter clothes, and shoes. Nearly 4000 people were taken off the streets of Paris last week – problem solved? Not for the kids left behind, or for the people who missed the buses on evac day, or for the new arrivals. Although the long awaited “Reception Centre” at Porte de la Chapelle opened, only 70 people were accepted to stay. There still remains a large number of people with no other option but the streets, and numbers continue to rise. Chased into hiding, asylum seekers have sought refuge under bridges, in dark alleyways, gated gardens, behind bushes where rats rustle through the leaves and under street furniture. Just because you can’t see them clustered in one place, does not mean these people are not still on the winter streets. Each night, we look for them, trying not to bring the attention of authorities to our main means of distribution (the van) or to the scattered sleeping spots the refugees have successfully found. By no means has this situation been resolved. 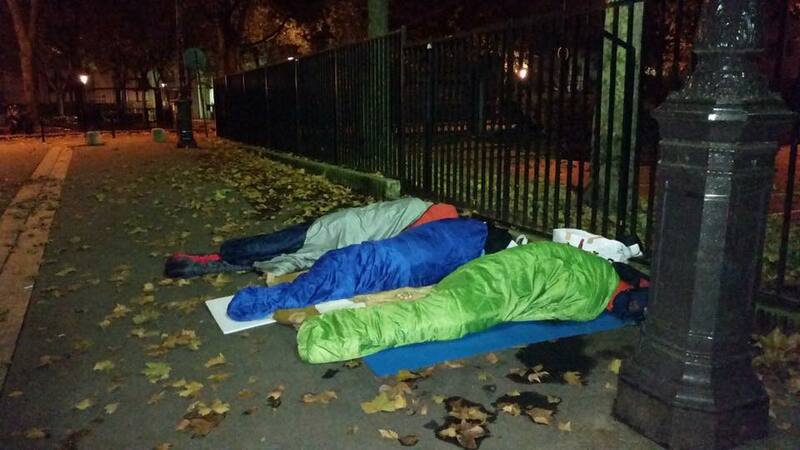 The fact is, there are children sleeping on the streets. It is essential that the media properly highlight the current situation and the ongoing lack of information and resolution. There is a need for a stronger presence of relevant local NGOs and more international NGOs taking action here and now.